The various complications associated with bariatric surgeries called for the need to look for a less invasive procedure with fewer side effects. Variable success rates have been reported by many studies after VBloc therapy with an average of 30% excess weight loss and improvement in comorbid conditions. Blockage of the vagal stimulation to the gastrointestinal tract (gut) is another way of achieving weight loss apart from bariatric surgery. The vagus nerve is the tenth cranial nerve, and it carries parasympathetic fibers to the heart, the lungs, and the gastrointestinal tract (up to the proximal two-thirds of the transverse colon) and its accessory organs. In the simplest description, the vagus nerve serves as the line of communication between the gut and the brain. Its principal function of the stomach is to convey the sensation of fullness and hunger to the brain while the signals from the brain accelerate digestion by increasing the production of digestive enzymes and gut motility. VBloc therapy uses a specialized device to prevent the signal from the brain from reaching the gastrointestinal tract thereby reducing enzyme production, decreasing motility with the overall effect of delay in gastric emptying.1 The delay in gastric emptying in expected to continue to cause satiety, prevent hunger and therefore reduce calorie intake. 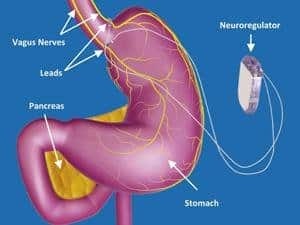 The system is made up of a pulse generator that generates and sends the electrical impulse, the two wires with leads that conduct the impulse to the vagus nerve, and outside the body is the remote controller attached to a transmitter coil and a charger. The controller allows manipulation of the impulse generated by the device. The average cost of a VBloc therapy is $18,000 with little variations across centers. In an ongoing study by Apovian et al., patients with BMI between 40-45 km-2 and those with BMI between 35-40 kgm-2 but with at least one comorbid condition were treated with either VBloc therapy or sham intervention. They were to be followed up for 5years. However, at the end of the second year, the average percentage excess weight loss in those with VBloc therapy was 21%. They also observed significant improvement in those with VBloc therapy regarding cholesterol level. The bad cholesterol and fat (LDL and triglycerides) reduced while the good one (HDL) increased. A slight improvement was also recorded in those with diabetes mellitus and hypertension. The glycated hemoglobin (HbA1C) reduced as well as the systolic and diastolic blood pressures. These patients also had improved quality of life. The most frequent adverse events are heartburn, pain at the neuroregulator site, incision site, and abdominal pain. Others include nausea, belching, and difficulty with swallowing. These events were reported as mild and most of them resolved by the end of the second year. In another study by Shikora et al., 28 participants were offered VBloc therapy. The average percentage excess weight loss after one week was 9% and rose to 25% (21-29%) at 12 months. Reduction in glycated hemoglobin (HbA1C) and blood pressure were recorded. In conclusion, VBloc therapy is a less invasive procedure for achieving weight loss. Although not as effective as bariatric surgery, it is safer with fewer complications, and reversible. Greenway F, Zheng J. Electrical Stimulation as Treatment for Obesity and Diabetes. Journal of Diabetes Science and Technology. 2007;1(2):251-259. Apovian CM, Shah SN, Wolfe BM, et al. Two-Year Outcomes of Vagal Nerve Blocking (vBloc) for the Treatment of Obesity in the ReCharge Trial. Obesity Surgery. 2017;27(1):169-176. doi:10.1007/s11695-016-2325-7. 1. Shikora S, Toouli J, Herrera M et al. Vagal Blocking Improves Glycemic Control and Elevated Blood Pressure in Obese Subjects with Type 2 Diabetes Mellitus. Journal of Obesity. 2013;2013:1-8. doi:10.1155/2013/245683.